The Italian Greyhound originated in Egypt, it is believed that the breed was brought into Italy by Roman soldiers. This breed quickly became the favourite pet of nobility. Today, it is one of the more popular Toy breeds in Britain. The Italian Greyhound is the smallest in the family of Sight hounds and is recognized as a Toy breed by the Canadian Kennel Club, the American Kennel Club, and the Kennel Club (U.K.). 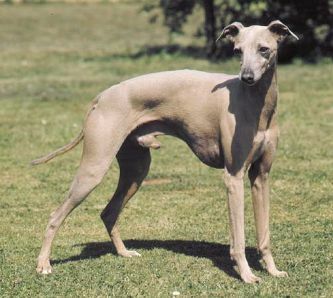 The Italian Greyhound is similar in appearance to the Greyhound but smaller and more slender in all proportions. Its appearance is one of supreme elegance and grace. Appearance: This breed has an extremely slim body with a slender neck and a long muzzle.